As the story continues, Ives, the romantic hero, turns the FBI inside out, investigating the mistreatment of his wife during the Luca case. In the process, he unveils a secret from her past, linking her a hunted bomber, who is threatening her life while leaving cryptic clues to a twisted conspiracy. 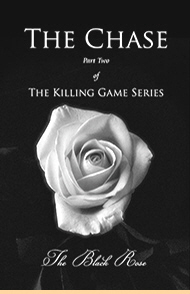 After an exhausting game of calculated, mental chase, the decisive moment arrives, and everything goes wrong when Ives and the bomber come face-to-face in The Chase, Part Two of The Killing Game Series - a literary romance fiction novel by The Black Rose. I loved this book and did not want it to be over. I am particularly partial to FBI suspense thrillers and this book, the second in it's series, has the added charm of being a romance novel as well. Ives and Alina have one of those relationships that is unfaltering and it is interesting to see how Ives handles romance being the powerful, strong male he is and Director of the New York division of the FBI. This is a timely story, yet it also is very much about a timeless relationship—one based on morals and values that we don't see very often in life today, or even in novels or movies. So if you're one for suspense but you're also drawn to a passionate love story, you want to read The Chase. I am waiting for the third in the series! I was so involved that when I finished the book, I felt like I desperately wanted to know what was going to happen to these two people and the life they have created together. "Love this Author's style. Love the main characters since I began the book because I know them from "The Killing Game" part one, The Blood Negotiators. .. love the plot..."
" all I have to say is: WOW! now I cannot wait for The Denial (Part III), keep on writing Black Rose!!" The rear right door of the limousine flew open before the driver had time to exit. Without waiting, or comment, a tall man, impeccably dressed in a dark charcoal suit, stepped from the back seat and made his way to the security checkpoint of the White House. He reached into his jacket’s left inside breast pocket and pulled out a small black leather wallet. Opening it as he approached the guards, they smiled at him, knowing who he was before he showed its contents. Without stopping him, they allowed him to pass. “Should we call ahead, Sir?” one guard asked. “No,” the man sternly said. Inside the entrance, two guards opened the first in a set of maze-like security doors after getting the signal from the gate about who headed their way. They were not sure whether to salute, bow or what, as he passed through the threshold. But before they could decide, he had vanished up a flight of stairs and quickly ascended to the Oval Office level. He knew who was now meeting with the President, Thomas Jaris, and that person was his purpose of this visit. Rounding the corner of the final corridor, Ives saw Agent Packer standing guard at the far end of the hall. He flashed a smile, then looked to the closed door where the President and his guest met. “Packer,” he said as he neared. “Chief Andrich,” Packer greeted as he reached for the doorknob. “Good morning, Mr. President,” Ives said as he walked through the doorway and straight toward his target sitting opposite Jaris—David Seagate, the Director of Internal Affairs for the Bureau, the same man who assigned Fleming to Allina’s case after the accident. Grasping Seagate by his suit lapels, Ives jerked him from his seat and with tremendous force, slapped him face down on Jaris’ desk. “What the hel—?” Seagate attempted to say as Ives twisted his right arm behind his back and snapped one side of a set of handcuffs on his wrist. “What did you say?” Ives asked, slapping the back of Seagate’s head. “Thomas? What’s going on here?” Seagate strained to ask as he was clearly confused and startled. Ives secured his left arm in the same forceful fashion, pulled him to stand straight, then shoved him back in the chair he had been sitting in seconds before. Jaris smiled and nodded concededly. Having enjoyed Ives’ performance, he knew how fortunate he was to have Ives on his side; he wished every agent was that confident. Ives looked at Seagate, then leaned down and right up to his face. “Did you think I didn’t know you were the one? You violated my wife’s rights and you’ll pay for that!” Standing straight, Ives motioned to Packer, who approached. “Violating your wife’s rights? Who the hell is your wife?” Seagate said although he knew that Ives had married Allina. “What? Tom, tell me this is a joke!” Seagate insisted as he stared at Jaris. Ives grinned as he stared down at Seagate. “Arrest? For what?” Seagate demanded as he fidgeted in his seat. Ives motioned to Packer, who immediately stood at attention behind Seagate’s chair. “Read him his rights and take him in for processing.” At once, Packer moved to take hold of Seagate. “I’m sorry, but it’s not in my jurisdiction,” Jaris answered. A Secret Service agent entered to assist Packer. Helping Seagate to his feet, they began walking him from the room as Ives heard Packer say, “You have the right to remain silent. Anything you say or do may be used against you in a court of law. You have the right to an attorney. If you…” Then his voice faded as they rounded the corner into an adjoining hall. Expelling a long breath, Ives stared at the empty doorway. So many thoughts rushed through his mind as he contemplated the chain of events that would follow this incident. Coming out of his private thoughts, he look at Jaris, then saw his outstretched hand and shook it. A somewhat distant smile briefly curled his lips. “Have a seat?” Jaris asked, motioning to the free chair in front of his desk. Ives shook his head but remained standing. “Will she testify?” Jaris asked, referring to Allina. Ives glanced toward the windows then back at him. “Stay for lunch,” Jaris suggested, but he could feel Ives’ rejection before he saw him shake his head. Jaris knew what Ives meant by before; he meant before Allina. “She must be something,” he commented. “No inconvenience,” Jaris commented and smiled. “Thank you again, Sir,” Ives said, then left the office. Making his way down the corridor, he took the same route as he had arrived by a few moments before. However, now it was quiet and all seemed normal. Passing through the entrance, he headed for his limousine. Once he was inside, the door closed and he heaved a deep sigh as the car moved slowly away from the White House. He pulled his cell phone from his pocket and called her. He hoped she was available and his hope was not in vain. “Hi, Beautiful, I miss you,” he said. He hoped she was smiling. “Where are you?” he asked.